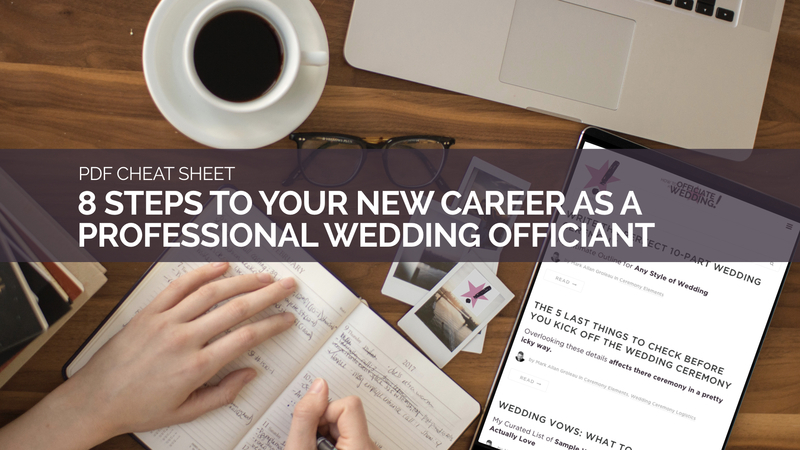 These eight steps are the stripped-down, everything-you-need blueprint to build your own professional wedding officiating practice from the ground up. In less than 12 months, I followed these steps and went from unemployed to a solo $50,000-a-year wedding officiating business. Here are eight steps that changed my life. Here’s how I did it. Here’s how you can, too. Okay, what a bummer of a way to start off, right? “Get legal?” Ugh. Sorry, I know. But there’s no sense doing all the work halfway down this list and then realizing that you can’t legally officiate weddings in your state or province. Find out how you can get legal to officiate weddings. Depending on where you live, if may be easy or difficult. If you’re a minister or a judiciary, chances are you’re already qualified. If you’re not, you have some hoops to jump through with your local government. Some folks go the Universal Life Church route. If that’s recognized where you live, go for it. For others, ULC is not recognized by their judiciary so they do something like join a humanist organization. Or they register for a course at a ceremony institute which might be recognized by their local marriage registrar. You might do what I did: go to seminary for a 3-year graduate degree and spend half a year becoming a licensed minister with clergy status. But that’s a lot of time and effort (and $30,000) just to officiate weddings. To be honest I kind of stumbled into this. I never thought I’d love it so much. I started out doing theology as my vocation and weddings on the side. Now I do weddings as my vocation and theology on the side! So whichever route you decide to take, don’t guess that it will be good enough with your local government. They’ll either say yes or no or recommend something. Ugh. This has been a drag so far, eh? But with this legal certification stuff out of the way, we can move on to the next step: the most important thing that will get you noticed in a market full of wedding officiants. I remember when I broadcast to the world that I was starting my own solo wedding officiating practice. A lot of my friends were fascinated and behind me, but some almost pitied me. One friend with experience in the industry even commented on Facebook, “Good luck, Mark. It can be a tough, tough business.” Uh… thanks. Here’s the bad news: your city is likely already glutted with an army of well-established wedding officiants. On to the great news: a majority of these fellow officiant colleagues are older, pretty set in their ways, settled into a rhythm of pulling out a canned ceremony for every wedding, and work for big officiating companies that have words like “eternal,” “personal,” “promises,” and “treasures” in their names. I’m not bashing them! Chances are, they’re getting booked. And if you want to fight for that marketshare of couples looking for a $200-$300 officiant and a “wham-bam” ceremony, by all means, you can jump right in there. Oh, and you can skip right to Step 4 right away. Do you want to set yourself apart and establish your own premium brand in the industry? Then read on. Here’s the golden question: when a couple is suddenly engaged to be married and find themselves Googling “find a local wedding officiant” for the very first time in their lives and no idea what they’re looking for, how can you be at the front of the line to grab their eyes – and their business? Tell the couple what they want – in your business name. Bingo. I literally took the words out of their mouths, made it my company name, and that’s how I find my ideal client. In business-speak, the particular way you’re solving a problem for people is called your unique selling proposition. As a wedding officiant, you need to figure out what yours is. It’s what will set you apart, and you need to make it about the client, not about you and what you like and want. You might love fluffy bunnies, but if all everyone else wants is fireworks, Fluffy Bunny Ceremonies won’t attract clients. In a world that wants firework ceremonies, you go with Fireworks Weddings. I learned this insight when I started listening to a business podcast called The Fizzle Show. It could not have come at a better time – right when I was considering starting my own company with zero business experience of any kind. (If you looked in a dictionary in 2015 for “English Lit major with a masters in theology, a penchant for philosophy, and no business experience,” you’d find my picture.) At risk of sending you down an entrepreneurial rabbit hole (that I dove down two years ago and happily haven’t emerged from), I have to recommend Fizzle’s terrific advice here on helping you think through your Unique Selling Proposition. Nailing down your unique selling proposition – the real problem you’re solving for real people – is an important step to getting booked solid. Don’t hang a shingle out there with a service that no one wants or understands. It should resonate. That’s why this step is not two separate steps: 1. Identify What Makes You Different, 2. Name Your Company. No. If you’re gonna make it in a glutted, Google-driven market of wedding officiants, it’s gotta be all one step. Figure out what makes your officiating different – what makes your ceremony just right – and then make it the name of your company. Only one name on that list clearly says, “Here’s what I’m about. This is what you want. Here’s what you’re gonna get from me.” In just 4 words. And the couple doesn’t even need to click to get it. It’s all jam-packed right there in the name. A name with a marriage quality won’t give you that edge in the market either. “What kind of ceremony do you want?” “We want an Everlasting Vows Ceremony.” Nope. All the established companies already have those names. And they got a twenty-year head-start on you when the market was wide open. A couple might not know they want that when they start looking, but they know it when they see it. So let ‘em see what they want in your company name. First thing. Answer: You figure out what couples want by doing your own market research. I know, that’s a scary phrase. “Market research.” But it really just means you ask questions. Here’s what it means you don’t do: you don’t just sit and think about it. This is not a meditational exercise. Here’s what it means you do do. After you hear enough answers, a picture will start to emerge, and you name your company. Ok – so you’ve talked to some couples. You’ve got a name for your company that communicates a general problem/need/want (“We want fireworks!”) and the solution you uniquely provide (“I’ve got fireworks!”). Down the road, you’re going to get clients by handing out your business card or getting eyes on your personal website or submitting your name to a referral service like WeddingWire (more on this in Step 6). Which means you’ll need some sort of profile. You’ll need to present a face – a brand – to the public. There are a few ways to do this. Excellent established graphic designers like my friend Joel at Brainstorm Studio or companies like Fiverr (which happen to be the bane of established graphic designers’ existence) will be happy to offer you branding services. I started noodling around on GraphicsSprings until I hit on a design I liked. I used Coolors for my colour palate. I paid something like $100 bucks for my logo and I go back to it whenever I want to make different variations of it and to save it in the format I need (for graphics or print). Squarespace Logo Maker will do this even cheaper. You don’t need to spend $1000 or even $500 on this. You might not even need a logo. Just get a recognizable font and consistent colour scheme wherever your name/brand appears and you’re all set. Oh, yeah! This part is pretty important. If you’re brand new to officiating, you could start with my post on writing the perfect 10-part wedding ceremony. And you can grab my full officiating guide here for the full gamut from meeting your couple to rehearsing to what to do on the wedding day. Maybe you want to go all next-level, knock the one-year learning curve down to a couple of weeks, and swipe 100% of my officiating tools and ceremony scripting. Get a VIP discount offer for my premium online course for wedding officiants called Unboring!Officiant. You’ll get all the details right in your email inbox. So you’re all certified, you have a sense of what makes you unique, you have a company name and a brand, and you know how to officiate a wedding. Couples are always going to want to see a website that explains all the details of your services and shows a bit of who you are. When I started, I had ZERO clue how to go about this. Thankfully, I found a guy named Robert at IT Arsenal through the Fizzle community and had him build mine for about $600. We went the WordPress.org route – a slightly more technical way to go about it. I’ve gone from learning things here and there with his help to building all my other sites (www.howtoofficiateawedding.ca and www.unboringofficiant.com) on my own. If you have some time and a bit of know-how, Squarespace is a pretty good place to get started, and it’s less technical than the WordPress route. 3) a website platform like WordPress or Squarespace. Rob built www.unboringwedding.com in about 3 weeks last January, I launched it at the end of the month, and I’ve been learning the ropes of WordPress and adding photos and videos and reviews to my website throughout the year. But we can’t skip to adding photos and videos and reviews until we find our first clients. You’ve come this far and done all this work. It’s time to find some people to marry! They’re somehwere. You just gotta find ’em. Four steps will get you well on your way. 1) First, tell your whole network that you’re in business and send ‘em to your website. a) Post about your new business on social media: Facebook, Twitter, and/or Instagram. b) Email everyone in your contacts telling them you officiate weddings now and asking them to recommend you when they hear about anyone getting married. 2) Second, buy some Google ads for your city and send ‘em to your website. The primary way that couples find a professional wedding officiant is Google. Google Ads could go a long way when you’re starting out before you get the word-of-mouth referrals and the organic ranking on Google. Consider buying ads on search engines that target anyone who searches for a wedding officiant within a 50km radius of where you live. Yes, you can do that! 3) Third, get your profile on a wedding referral site and send ‘em to your website. I advertise in one place and one place only: WeddingWire.ca. I do that because WeddingWire is huge in Toronto; it’s the primary site that couples land on when they Google “find a wedding officiant in Toronto.” There’s a free option for officiants to get listed, but I pay for a premium listing. It costs me $135 a month and it’s worth every penny. I average 1 lead per day from WeddingWire, get almost all my “cold leads” from WeddingWire, and convert at least 2 or 3 of those leads into clients. Maybe there’s another website that’s more popular where you’re located (like The Knot, for example). Start by Googling “find a wedding officiant in [your city],” see what comes up in the first few organic hits, and then get your company profile listed on one or two of those sites. 4) Finally, make a business card and hand it out liberally. When you start officiating, you’ll meet other vendors: venues, photographers, planners, and DJs. It takes an army to pull off a typical wedding, and these are your new colleagues. After enough weddings, you’ll start to get direct referrals by couples, their guests, and these other wedding vendors, and you may not have to buy as many ads anymore. Until then, hand out your business card to as many people as you can. I made mine with Adobe Illustrator and got them printed by Moo. A word about your fee: until you get some photos of you in action and some reviews, you might want to charge a lower, more competitive fee. Once you have a few weddings under your belt, you’ll be able to charge more than (or as in my case, double) what others are asking. Don’t be scared to charge more than what other officiants are asking. Remember, there are two markets out there: one market that is looking for “wham-bam” minimal services, and they’re not going anywhere; another market that’s looking for premium, top-of-the-line services, and they’re not going anywhere. Decide which market you want to serve. You can cut your teeth in the lower market, make a name for yourself by way overdelivering, and then raise your fee to match your premium service. This is a crucial step to building your practice and scaling up. As quickly as you can, you want photos and even video of yourself in action officiating weddings. Couples who click on your ad or profile will have a more positive impression of you when they see you doing what they want you to do for them. 1) In the planning stage, ask your couple who is taking their pictures. 2) On the wedding day, make sure you introduce yourself to the photographer. 3) A week or so after the wedding, reach out to the photographer. You can usually track them down via their website or their social media accounts. Ask them if they have any great photos of you officiating, and tell them you’d love to feature their work on your website. Remember, there’s a lot of etiquette and even licensing issues around using a photographer’s work. Some may have some strict stipulations around your use of their photos. Here’s the best practice: if you use their photo, first ask your couple if it’s okay. Then make sure you give photo credit to the photographer and even directly link to their website right below the photo. Most photographers are happy to feature their work on your site because the couples landing on your site are the exact clients they’re looking for, too. That’s why it’s important to offer photo credit and link to their website. The more weddings you do, the more photos and videos you’ll get and the more business it’ll generate. Photos and video are hugely important for generating new clients. In the online services space, the #1 factor in generating new business is client reviews. After every wedding, follow up with your clients and ask them for a review. And make it as easy as possible for them to write one. On my website, I’ve created my own reviews page where I paste the thank-yous couples send me and any public reviews they end up writing. But it’s the third-party review spaces have the strongest credibility, so I always ask couples who found me on WeddingWire to review me on WeddingWire, and I send them the WeddingWire review link. For clients who found me via personal referral or another way, I ask them to review me on Google, and I send them the link where they can do that. I always ask my clients to write a review in one place or the other. Now the ball is rolling, and it’s just gonna keep on going. You officiate. So you get photos. Then you get reviews. And you get referred. So you officiate some more. You’re eventually really, really busy. Then you’re booked solid. You charge that premium fee. And now you have your own full-time business with great flex hours and a comfortable income. 'Want this post as a cheat sheet?